Rich N Famous malayalam movie, the directorial debut of Anoop Nair will feature Maqbool Salman and Sanjana in lead roles. Produced by Sadanandhan Rangorath and Rebo under Dream Marchant banner, the movie will be blessed with the magical music from the hands of Dhrona. The screenplay and dialogues would be handled by Syam Mohan. Malayalam film industry has opened doors for budding talents to prove their mettle on screen and behind the camera. For those youngsters, who keep a passion and desire with movies, it would be the right time to get attached with the industry. With 3 solid months passed on, the number of malayalam released in 2013 has recorded 50. The next big thing to watch is the 200th movie which would be released in the current year. As a long line of movies are under the making process, it is much sure that the releases might not settle with the magical figure of 200. As the young film makers are bold enough to settle with wacky titles and novel themes, the movie enthusiasts are ready to accept those works which carry elements of ecstasy. Keeping his toes strong, debutant Anoop Nair is gearing up to unveil an innovative story which features Maqbool Salmaan and Sanjaana in lead. Titled as 'Rich N Famous', it would be fun ride movie flavoured with humour and thrills. 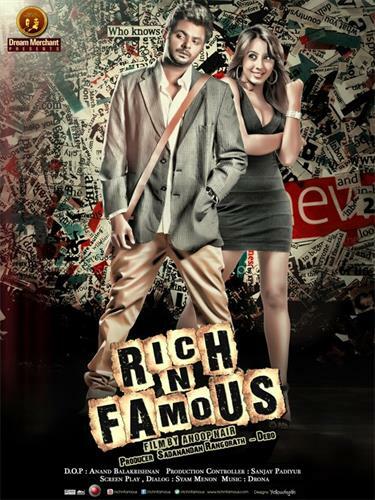 The first look posters of 'Rich N Famous' add more excitement as it is tinted with natural colours which can make the viewers intact. The posters which were released via social media sites had already created a huge buzz. Produced by Sadanandhan Rangorath and Rebo under Dream Marchant banner, the movie will be blessed with the magical music from the hands of Dhrona. The screenplay and dialogues would be handled by Syam Mohan. The cinematography of 'Rich N Famous' would be safe in the hands of Anand Balakrishnan while Sanjay Padiyoor serves as the production controller. The movie will be start rolling from 20th May and is expected to hit theatres during Onam.